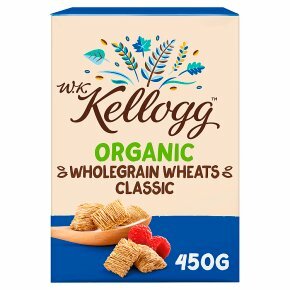 No Added Sugar Organic Shredded Wholewheat. Organic. Nutritious & uplifting plant-based foods. Don't be shy pick me up! 100% wholegrain. No added sugar - contains naturally occurring sugars. Palm oil free. No artificial sweeteners, colours or flavours. Suitable for vegans and vegetarians. Halal - HFA approved. Kosher. Contains ? 15% RI magnesium. Magnesium contributes to the reduction of tiredness and fatigue.